This recent view across the valley from Gaiman shows how green the irrigated valley floor is by contrast with the dry plateaux on either side. As the visiting Captain Kennedy had predicted in 1887 the railway's initial traffic was likely to be fairly light. The colony's wheat crop did reach 8,000 tons in 1888 as he had anticipated but on a second visit in March '88 he notes that the settlers were not at all impressed by the railway charging £1 per ton for the journey to the coast, especially when the onward journey to Liverpool cost only 15s 9d per ton! There were suggestions that small boats down the river and a tug at Rawson would do the job more cheaply (1). Captain Musgrave of HMS Cleopatra visited in March 1890 by which time the annual wheat crop had risen to10,000 tons. The railway was now operating a monthly steamer, the SS Chaseley, to Buenos Aires. Traffic levels on the line cannot have been too depressing for the company had aired the possibility of extending westward to the Pacific. However, the following year's visitor, Commander Lewis Wintz of HMS Basilisk, was less optimistic. 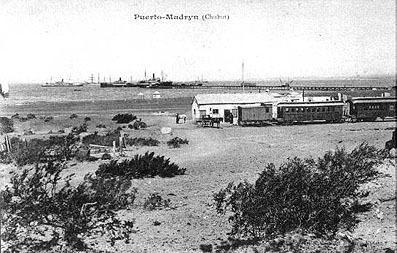 The monthly journeys of the steamer Chaseley had been abandoned although ships of the Gulf Line were calling at Puerto Madryn on a regular basis. The rail goods tariff had fallen to 15s per ton but there were still occasional attempts to boycott the line. Cdr. Wintz points out that there was really only substantial traffic for half the year. 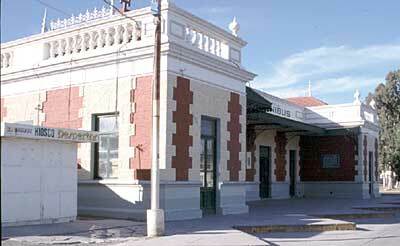 His journey to Trelew had been on a special train but he records that his return was by the 'ordinary weekly train'. The cover of the FCCC rule book for 1890. The government Estadística (Statistics of Operating Railways) in 1892 gives the annual total engine-kilometres as only 10,735 or just 34km per working day (2). On the other hand a list of employees, dated 1890, includes 62 names (3). It does list only one engine crew, of two names. The 1892 Estadística shows 5 employees in 'traction and workshops'. Another unknown source suggests that by 1894 the annual number of train journeys had reached 140, totalling 133,319 km. The American traveller J. R. Spears, writing in 1895, gives a less precise but more personal set of impressions (4) – "a road of a metre gauge was built, and a very good road it is, considering that English stock and materials were used." and talking of out of season traffic – "a train... every time a ship comes to port, say once in three weeks." and finally "As compared with some Yankee railroads, the only railroad in Patagonia is no great affair; but when compared with some others it leaves them out of sight, because it pays dividends as well as develops the country." 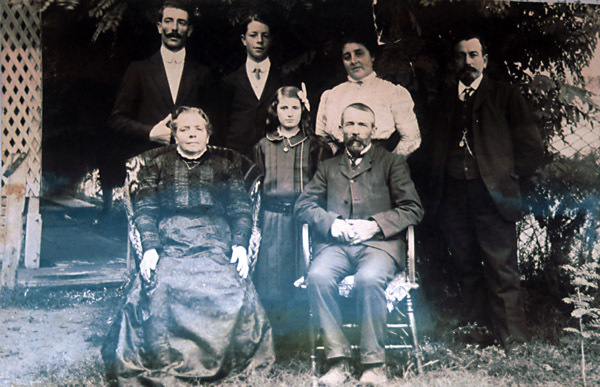 The railway's 'inspector', John Hughes Jones, seated, pictured with his family (5). By 1895 the combined rail and sea freight rate to the Federal Capital was down to £1, or just 11s for the train journey, including lighterage. Any talk of line extensions had been put on hold. Captain Charles Norcock of HMS Acorn, during an 1896 visit, discussed the railway with a local minister, Mr. Lloyd Jones, who suggested that the line had been constructed prematurely and that the colonists had not wanted it. Nevertheless, despite his own initial opposition he could see the use of it, and he noted that 6,000 tons of wheat had gone out by train that year and only 600 tons by the competing river boats (6). The availability of the onward link to Buenos Aires continued to vary. 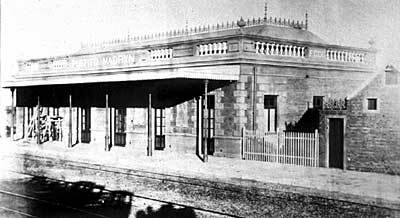 By 1898 the Gulf Line ships were no longer calling at Puerto Madryn but three government steamers had taken over the traffic. In addition the Chubut Maritime Company of a group of Welsh colonists had purchased the iron barquentine Annie Morgan of 500 tons with a view to running a regular service northwards. Traffic was very low this year owing to the plague of locusts which attacked the wheat fields. The possibility of extending westward was resurrected in time and a full survey was undertaken in 1899. A petition was before the Argentine Congress for the railway to be allowed to extend 300 miles west, all the way to the cordillera. However the serious flooding in July and August of that year put all plans on hold whilst the community recovered. The railway itself had been built well clear of the floodplain but Gaiman was severely affected and Rawson almost totally destroyed. 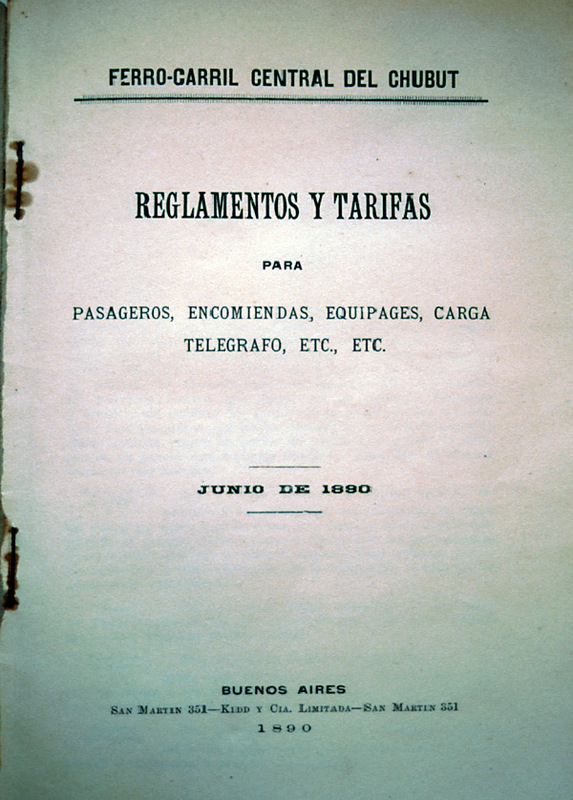 Around the turn of the century the naval reports became involved in continuing disputes between different factions within the Chubut community. Those settlers who still held to a strict Welsh non-conformist uprightness were very critical of the railway company for bowing to the government's wishes, and of the naval captains for expressing the opinion that the colony would soon become totally assimilated and would lose its Welshness. Eventually a substantial group of settlers set off for a new life in Assiniboia, Canada. This was not a happy period in the life of the colony and Lewis Jones, the initiator of the railway, seems to have become very tired and disillusioned towards the end of his life. Commodore Robert Groome, arriving in HMS Basilisk in April 1901, wrote “The manager of the railway, when the ship was sighted in the bay on the afternoon of the 17th, very kindly delayed the departure of the train then ready to leave, until the following morning.” In October of that year another report mentions a train running 'every three weeks or a month', this being out of the main traffic season. The 'Annie Morgan' was regularly managing five round trips a year to Bahia Blanca and Buenos Aires at this time, but the Hamburg Southern American line was also calling in to Puerto Madryn every three weeks or so. Wheat from the Welsh farms was by this time winning prizes at international expositions. However, it was later discouraged by the government to protect the maize growers of the north. 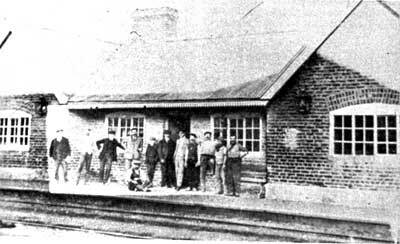 Economies seem to have been made by the time that the annual government Estadistica for 1906 reported that the railway had 32 employees. Three of these were in management, five in ‘vía y obra’ (PW, works, and telegraphs), nineteen in traffic, and five in the workshops. Loco no. 3 on a long freight, again with the strange bogie wagon at the front. Perhaps this was a water tank mounted on a 'plataforma' wagon. A postcard (7) shows Puerto Madryn 'muelle' and rolling stock with a variety of steam and sailing ships in the background. Early in the new century a number of people seem to have spotted the opportunities in Argentina’s southern territories. 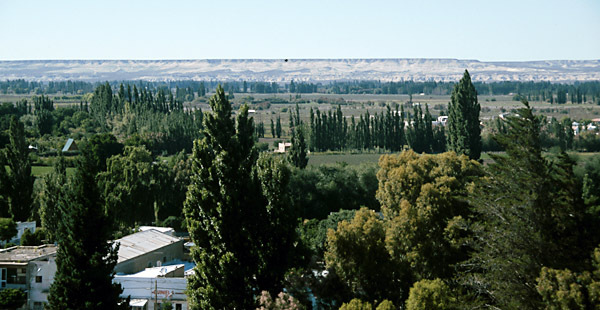 Puerto Madryn began to grow, though its population was still below 200. A group of entrepreneurs, not known by name but probably amongst the shareholders of the Argentine Southern Land Company, obtained an option to buy up the majority of the railway's shares. In trying to add to this the land company's own properties in Puerto Madryn, they had to compromise. The eventual outcome was that a new company was formed, the Port Madryn (Argentina) Company, whose shareholders were initially limited to those of the Southern Land Co. In 1906 control of the railway company therefore passed to this new outfit. The chairman of all three boards was Frank Henderson (8). The whole of the issued shares being owned by the Port Madryn company there were no regular general meetings of the railway company for the next few years to enlighten us on company decisions. However, the new directors wasted no time in shaking up the railway. The parent Port Madryn company was contracted to build and equip the long-delayed extension to Gaiman, to build a new Port Madryn station, new workshops, and a new steel muelle. Two new locos were ordered, new wagons, and three Ransomes & Rapier steam cranes for use on the muelle (9). More shares were issued at this time to pay for the works. 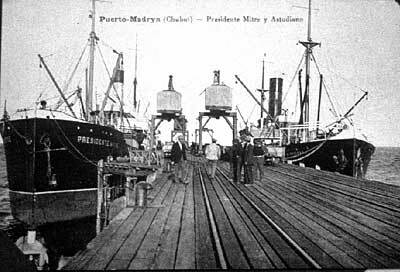 The 1910 muelle at Puerto Madryn with two steamships, the Presidente Mitre and the Astudiano, in port. The new station building as seen from the platform side. The other side of the Puerto Madryn building as seen in 2000. After the line's closure the station became the town bus station for some forty years. A new bus and coach station having been completed recently on old railway land, the station building might yet become a new town museum. 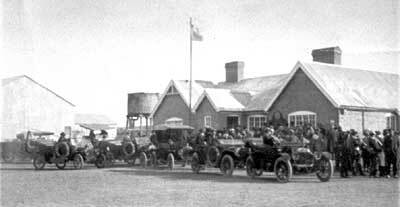 Anyone wanting to see other old photos of Puerto Madryn should click here to move to Victor Moron's historical pages. Unfortunately he has only one which shows the railway, taken from the usual hillock behind the station. The table below shows traffic figures for the years 1900 to 1918, as collated by Susana López de Monedero et al (10). The data was obtained from the Government Estadística de los Ferrocarriles en Explotación published each year (11). The changes after 1906 are easily seen. From a fairly static baseline in the first years of the century, by 1913 the freight figures have quadrupled and the passenger figures gone up eightfold! Whilst much of this results from the Gaiman extension opened in 1909, it is nevertheless an impressive trend. The 1922 figures are for ten months only. After the completion of the Gaiman line the Company board must have gained enough confidence to start planning the next push west. In 1913 6% debentures to the value of £125,000 were issued to fund the work. The following year the original £10 shares in the company were divided up into £1 shares. This presaged the distribution of the shares amongst a much wider public, a situation which continued until the company's final demise. The Trelew staff pose on the platform in 1915. The extension to Valle Superior (later known as Dolavon) was opened in 1915. As the table shows the passenger figures continued to increase but the freight tonnage had reached its peak and varied thereafter between 22,000 and 30,000 tonnes. Trelew apparently had 600m. of loop(s), 600m. of sidings and a turntable (12). The 'town' side of Trelew station with a good collection of early motor cars. The date and occasion are unknown. As well as regular services there seem to have been excursions of various kinds. Loco no. 3 has pulled a trainload of passengers up to Joseph's Tower (now known as Loma Maria), a pointed hill at the summit of the line (Km. 22). This was captioned as a Sunday School picnic (20), but there are a number of photos taken at the same spot and with different motive power, so it may have been a regular picnic spot! Interestingly, the train includes five of the original Bolling & Lowe supplied passenger carriages - two 2nd class and three 1st class, as well as the bigger 1st class coach number 1. Joseph's Tower is a name which occurs from time to time in the early history of the Welsh Colony, and as a destination for their outings by train. 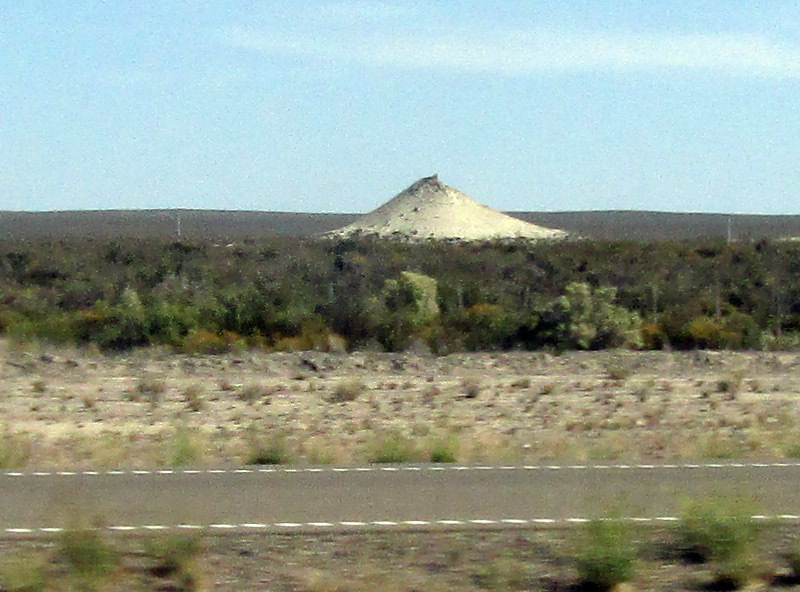 It is the white pimple in the middle of the picture taken from the modern road linking Puerto Madryn to Trelew. The absolute flatness of the area and the mount's usefulness as a point of reference from miles around, or as a vantage point, can readily be appreciated in this view. Once a change of government had made it apparent that the proposed broad gauge network in Patagonia would never be finished, attention turned to the alternative possibility of a cheaper narrow-gauge network. By 1921 these proposals were actively being pursued. Whether the government had originally considered joining up with the FCCC is not clear, but in December 1921 a deputation of settlers from Chubut petitioned the state president that the FC Central del Chubut should be taken over and used as the first stage of a line westwards towards the cordillera. The state railways' administrator Señor Fernández Beschtedt was present at this meeting and, given that the state president confirmed the government's intention to do exactly that, it is clear that there must have been discussion beforehand (13). In mid 1922 the FCCC board commented to its shareholders on the unsatisfactory state of the company and the lack of any prospect of improvement. This was partly due to a downturn in trafiic in the previous three years and partly to a three month strike early in 1922. The directors asked for permission to negotiate the sale of the line to the state railways (14). Clearly other alternatives had been considered, for the shareholders were told that competing with the FCE would require more wagons and imply a further loss. The board were therefore authorised to negotiate with the FCE but initially a leasing of the line was agreed whilst government approval for the purchase was obtained. Partly as a consequence of the government lease, a variety of company statistics from after the First World War are available. A number of these were recorded in a report by Rodney W. Long for the US Bureau of Commerce in 1926 (15). He sets the scene by explaining that the Central Railway of Chubut Co. Ltd. continues to operate from River Plate House, 13 South Place, London, EC2, with Frank Henderson as Chairman and H. C. Withers as Secretary. The company's consulting engineers were Livesey, Son & Henderson, a company well known for such work. In Buenos Aires the offices were at Calle Balcarce 278 where the company's representative was F. J. Wythes. A balance sheet for the year ended June 30, 1924 follows. 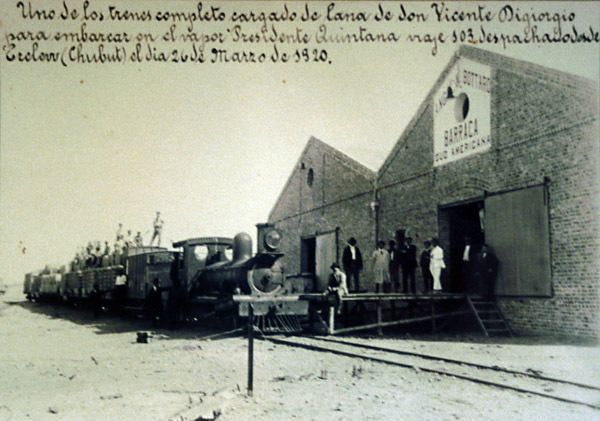 Whilst by this time the railway itself was being operated by the FC del Estado, the company remained in existence pending outright purchase of the line by the government. Perhaps more useful are the figures given for railway receipts and expenditure in 1922, the last complete year before the FCE take-over. Figures for 1913 are also given. 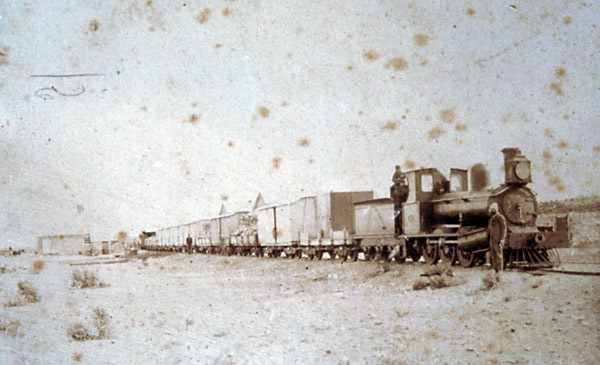 Towards the end of the railway's independent existence a wool train, again for Don Vicente Digiorgio, is pictured in Trelew, on 26 March 1920, before its departure for Puerto Madryn. The engine is no. 6. Photo courtesy Museo Regional de Trelew. The railway obviously required its own telegraph for operating purposes. A service was also provided for the general public at a charge, and for the government free of charge. Examples of a letter, a telegram and invoices from the railway's early history are displayed on an appendix page. By 1922 there was a telephone link the length of the line (16). 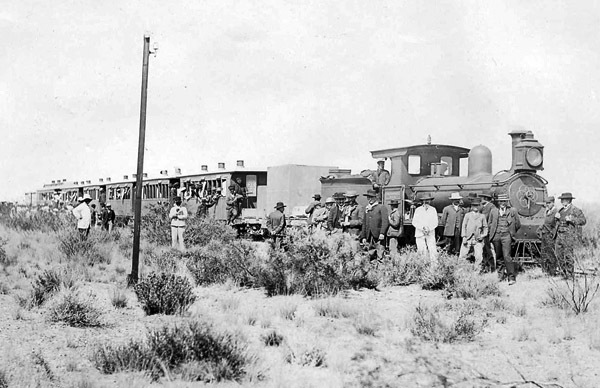 By 1922 the railway's assets at Puerto Madryn were recorded as including: a 452m. long steel wharf or 'muelle' which had replaced the original in 1910, 3 three tonne travelling cranes, 1 ten tonne stationary crane, a 29 tonne tug, and 4 lighters varying in capacity from 56 to 159 tonnes. (17) The track was recorded as including a 450 m. loop line, 2,500m. of sidings, a turntable and a 50,000 cu. m. water tank. A comprehensive list of features along the line, and equipment at each station is available in an appendix page. After the Government leased the line in 1922 the company stayed in existence as the owner though not now the operator. The expectation was that Congress would shortly approve the outright purchase of the assets after which the company could vote to wind itself up. However, The dire financial situation of the state railways throughout the 1920s meant that year after year the FCE merely negotiated another twelve month lease. This was not necessarily a bad thing as the Investors' Chronicle' dryly noted in July 1923: "State acquisition seems to benefit some railways at any rate. This company, leased by the Argentine State lines during two-thirds of the year to 30th June, as a result pays 2 1/2 % -- its first dividend since 2% was paid for 1917-8. (18)" Whilst this happy situation suffered later from FCE rental payments being somewhat in arrears, by 1928 a dividend of 6% was being paid (19). The purchase by the FCE eventually went through Congress in 1934 and the company served no further purpose. A resolution proposing a voluntary winding-up was passed in December 1936. When the assets were calculated there was a payment of 14 shillings in the pound to the shareholders. A further final payment of one penny halfpenny in the pound was made in 1947 and the final winding-up meeting held on 31st July 1947. As extra photos of the railway are found they have been added in appropriate locations. However, there are are a few extra ones in an appendix page accessible from here. 1 Reports of Royal Navy officers are preserved in the National Archives, Kew, London. Folder no. ADM147/1, with some additional typed or printed versions in folder HO /10460/B23142. 3 List in Gaiman Museum, examined 1975 and 2000. 4 The Gold Diggings of Cape Horn. 1895. J. R. Spears. G. P. Puttnam’s Sons, New York & London. p179-181. 5 Photo from Gaiman Museum collection. 6 Reports of R. N. officers. Op. cit. 7 This postcard kindly provided by Christopher Walker. 8 From London Stock Exchange yearbooks, and Central Railway of Chubut statutary returns to the Board of Trade. 9 The archives of Messrs. Ransome & Rapier of Ipswich, England, now held in the Suffolk County Record Office, contain details and photographs of the equipment built. In 1908 the Port Madryn (Argentina) Company ordered a piling rig for the construction of the new steel muelle. Soon after came orders for one ten ton fixed crane and two three ton travelling cranes to run on rails at 13ft centres. An identical three ton crane was later ordered, in 1913, this time by the railway company itself. 10 Historia del Ferrocarril Central del Chubut – Aportes Preliminares. 1988. Susana M. López Monedero et al. Universidad Nacional de la Patagonia. 11 Estadística de Ferrocarriles en Explotación. 12 1922 inventory recorded in Review of the River Plate, August 18 1922, page 421. 13 Meeting reported in the Review of the River Plate, December 30 1921 page 1709. 14 Review of the River Plate, July 1922. 15 Railways of South America - Part 1 Argentina. 1926. Rodney W. Long (& George S. Brady? ), U.S. Bureau of Foreign and Domestic Commerce - Trade Promotion Series No. 32, U.S. Government Printing Office, Washington D.C. 267 pages. 16 Review of the River Plate, August 18 1922. 17 Review of the River Plate, August 18 1922 p421. 18 The Investors' Chronicle & Money Market Review July 28 1923, quoted in Review of the River Plate August 31 1923. 19 Review of the River Plate, July 25 1930 p47, and August 22 1930 p27. 20 Picture provided by courtesy of the Anglican Diocese of Argentina.